I don’t know about you, but MY spaces in the house tend to get neglected. That usually means I spend a lot of time, effort, and money making our common areas and guest room look amazing. Meanwhile, that leaves our master bedroom and bathroom looking a bit…dull. A few months ago I decided to make some inexpensive changes to our master bedroom. I wanted to give it a face lift and I wanted the overall vibe to be calm, serene, and relaxing. Wouldn’t it be nice to go to bed at night and actually unwind, pick up a book and read, or light a candle? I also wanted to add a few organizational elements, mainly for jewelry, sunglasses, pocket change, etc. which I found was lying around everywhere! A few things to note about our particular master. It is located in a basement (sort of) with limited light. So it was very important that we use a lot of white elements to brighten the space. Also, we have a cream carpet that only runs through our bedroom (the previous owners installed it), so to save money, we haven’t added a rug yet. Finally, our closet is teeny tiny, but we are lucky to have enough space for two dressers - his and hers. We already had grey sheets, but our comforter was looking really dingy. I knew I wanted to freshen up the bedding with something white. We also happen to have a cat with white fur, so a white comforter saves me from a few extra washes here and there! West Elm Cotton Stripe Duvet Cover - I love the light and airy feel of this duvet cover. I get super warm at night, so having something light-weight is really important to me. Pottery Barn Essential Flat Sheet in Grey Mist - We happened to have grey sheets, but I really like these classic sheets from PB. West Elm Cotton Stripe Sheet Set - We went with just the pillow cases, as we already had the grey sheet set. Rustic Farmhouse Cotton Stripe Blanket Throw - I like to put a throw blanket at the foot of the bed. This one is soft and super stylish. Pottery Barn Pieced Leather Lumbar Pillow Cover - Accenting with moody greens, blues, and a little bit of brown/leather made for that serene vibe. McGee & Co. Moody Pillow - Again, this nice, deep green was a good accent for creating a calm color wheel. One of the key things I learned in terms of bedroom furniture is this: it does not all have to match! Our nightstands do not match my dresser and our dressers do not match our headboard. Just like they used to say on that show What Not To Wear “it doesn’t have to match, it just has to go”. The same applies for home decor. Loring Nightstands Project 62 at Target - For nightstands, we went with more of a white oak, lighter wood. Steuben Table Lamps at Target - I love, love these white table lamps. They are tall enough for our bed-to-nightstand ratio, which is important. Black Picture Frame with Mat - To add more height and depth, I hung two black photo frames above each of the nightstands. I printed out photos with blue-hues, from the beach or sunset, to keep our serene color palette. Faux Succulents - Adding greenery to any room is a must! Especially when you are trying to create that spa-like environment. As I mentioned, we don’t get any natural light in our basement bedroom, so I had to go with faux plants. I have a faux succulent on each of our nightstands. 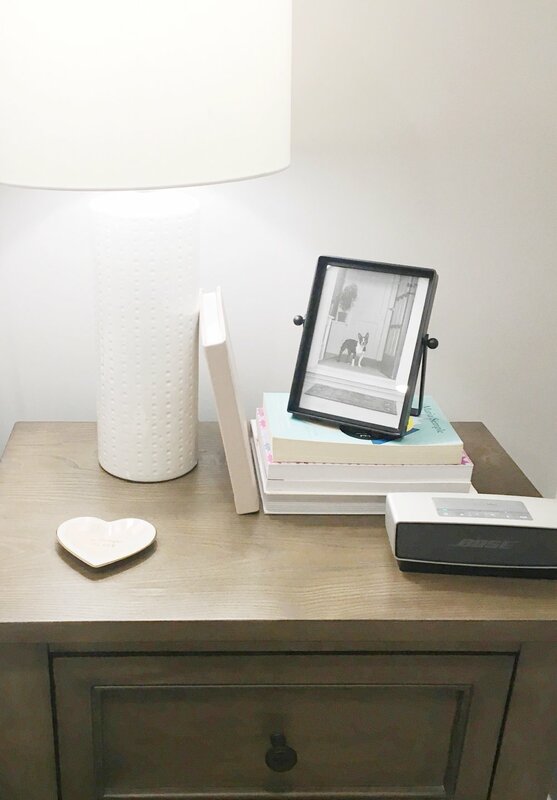 Catchall Dish - I have a catchall dish on each of our nightstands. I use mine for rings and jewelry that I take off at night. The hubs uses his for pocket change. Books - I like to read a little bit before bed (on the nights I don’t fall right asleep!) so I keep a stack of books on the nightstand. I love the trend of turning the bindings to face the wall, especially if they are brighter colors and do not go with the room decor. I ended up doing the same thing to my husband’s books. Placing a metal decor element on top of or next to the books also adds another texture (I used a metal photo frame, for example). As I mentioned, we have two dressers in our bedroom - his and hers - because our closet is so small. This works out nicely for us, as our bedroom is fairly large. I knew my dresser styling had to have a lot of function, since I needed some way to store all of my jewelry. His dresser is a bit more simple, only needing a place to put his watches and occasional pair of sunglasses. 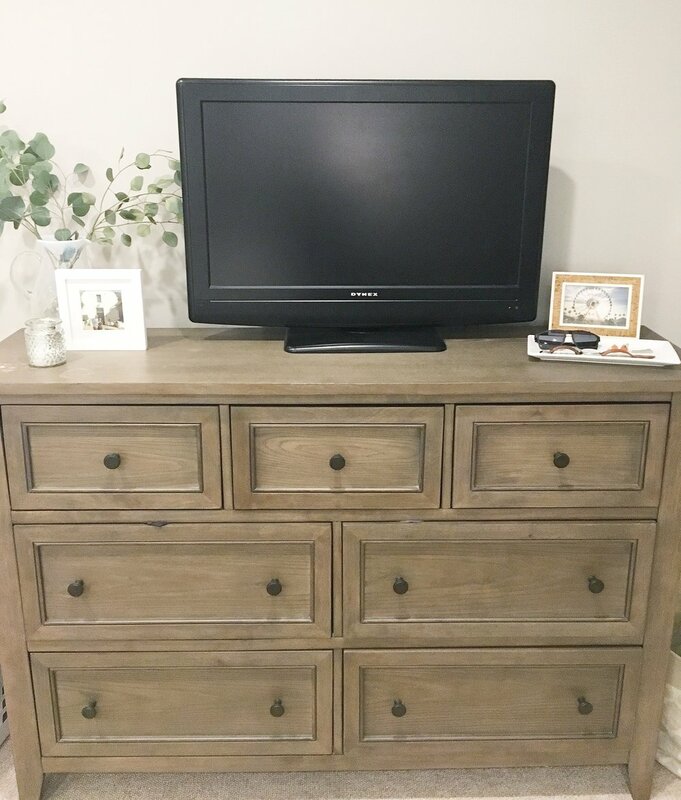 Black Vintage Dresser - I have had this dresser for years and it was given to me by my Grandma! I painted it black a few years back, although it is probably time for another coat of paint. I love mixing vintage pieces that have character, with new, modern furniture. Jewelry Holder - A good jewelry holder was a MUST for the dresser top. I looked around and found the best options at Target and Amazon. I went with something that had room for hanging necklaces, bracelets, and catching earrings and rings in the bottom tray. Glass Display Box - Even with the jewelry holder, I still needed a spot for my bigger bauble necklaces, as well as sunglasses. I chose to put them in a display box, similar to this one on Amazon. Candle - What serene bedroom is complete without a candle? My favorite scent is actually Endless Weekend at Bath and Body Works! I am obsessed and I stock up whenever I can. 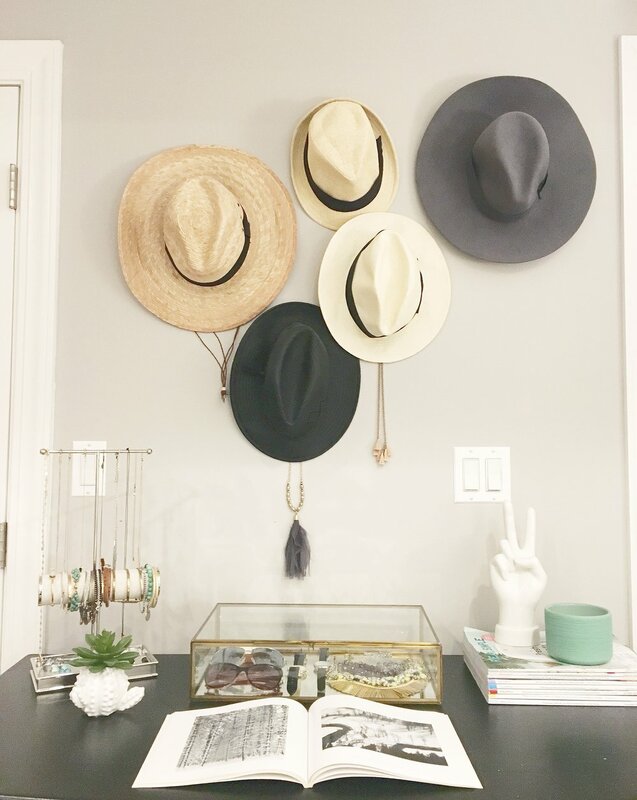 Hat Wall - I never thought of myself as a hat person, but all of a sudden I noticed I had accumulated quite a few hats! I needed somewhere to put them all, so I went with the hat wall above the dresser. The good news is - this is SO easy to do. I used thumb tacks (a trick a girlfriend taught me) but you can also use small nails. There is no specific measurement to it, just make sure the hat brims are slightly overlapping if you want this specific look. Warm Grey Dresser - A simple dresser with lots of drawers for foldable clothes. The height is also a bit taller, which is nice for him. Leather and Bamboo Valet Tray - I noticed we needed a spot for the hubs to put his watches and sunglasses, so another catchall dish, a bit longer, did the trick! Faux Eucalyptus - I wanted to add a little height and more pops of green on the dresser. This is my favorite faux eucalyptus and it is such a great price on Amazon! 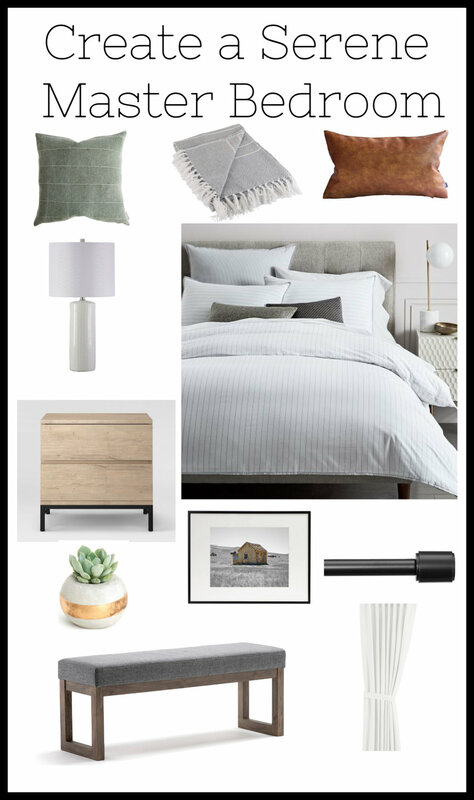 I hope you found some inspiration to create your own serene master bedroom.